Best wedges for golfers - Covering pitching, lob and sand wedges. A decent wedge is a very important club in the bag. Get the right club to suit your style and you’ll be on your way to making better recoveries from the bunker and improving your short game. Don’t just accept the one that came with your set of irons, for us, this is a special club for a specialist shot and selecting the right wedge is essential for improving your game. Our guide covers all the best wedges for every level of golfer and all types of wedges – Sand, loft and pitching wedges. Use the menu above to find your level or club that you are looking for. We can start with my favorite wedge – the sand wedge. It’s becoming increasingly trendy to just use a standard wedge out of the bunker especially with a clean lie but for me, the sand wedge is essential in the bag. Picking the right club can improve your bunker shots and shave precious shots off your round. Being in the bunker will be dreaded no more! The matte black option on this club looks absolutely incredible and this is the ultimate sand wedge. This club was designed by Callaway alongside Phil Mickelson for a more open face aggressive wedge and it really packs a punch! Mickelson likes it so much he carries both the 54-degree loft and the 60-degree loft when he plays on tour. The club is designed to be a versatile wedge that can be used out of the bunker or anywhere around the green in your short game. The bounce on the wedge makes it perfect for shots from the sand trap. As well as being, in our opinion, the best wedge for bunker shots its versatility means its a club that will get used all around the course – the perfect addition to any bag. The design is focused on more surface area and longer groves to better connect with the ball in when hitting it with an open face. This club really will help you get more backspin on your short game. Officially it has 39% more groves that go almost all the way across the face of the club. Callaway and Mickelson took the older wedge and set about a process off making it a versatile wedge that you can be aggressive with on the course. The weight has been moved higher which allows you to use this club even in think rough and still play a decent shot. We’re really impressed with this club and reviewers on the Callaway site seem to be too. Users are saying it is the best wedge they’ve ever owned and its a “get out of jail free” club, plus one user says even if you miss hit it slightly you’ll still get some spin due to the extended grooves. You can get this awesome wedge from Amazon below where ever in the world you play golf! If you’re looking for different options you can change between the matte black and the chrome and the 60 degrees or 54-degree loft to get the right one for you – or you could always carry both like the main man Phil Mickelson does. Here’s our selection if you don’t want to fork out for the Mac Daddy wedge but still want a decent wedge in your bag. The Pine meadow PGX wedge comes from golfing manufacturer Pine Meadow and this club comes with lots of 5* reviews on Amazon currently (see here). At this price range, it’s an absolute sand out club from the rest! For right handers there’s a choice of loft – 52, 56 and 60 degrees, for lefties there’s only a 56-degree wedge on offer. As you’ll see from above this is a very aesthetically pleasing wedge and looks the business in your bag. It does not come supplied with a head cover so you may need to get one if you want to keep it looking its best over time. As you can see below its a great value wedge! The lob wedge is a club that takes some practice to master if you want to hit the real up and down flop shots. Persevere with it and you’ll find its a brilliant club to have in your bag. We’ve selected this as out best lob wedge due to the range of angles you can get it in. Whilst most manufacturers go to a 60-degree loft the RTX-3 goes as high as a 64 degree – which is superb for lob shots around the green. This range of wedges has a club every 2 degrees and has the full range left handed as well – unlike some others. We also rated this as our best left-handed wedge for all lefties due to the range. 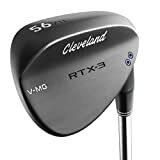 The latest price on Amazon is shown below for a 60-degree wedge if you click through to Amazon you can change the loft of the club, or select left-handed if required. What degree wedge should I get? Most wedges come in two options, usually a 54 degree and a 60-degree loft, some come with 52-degree and 56 degree – this varies by manufacturer. This is your standard wedge for your short game in and around the green. Great for using off the fairway in the light rough around the green, probably not the best for bunker shots really. Mainly a club for your short game, depending on your level can be used anywhere you’re 60-80 yards from the green. Hit with the correct stance and control will get a decent backspin on. Most wedges now are described as a “bounce wedge” which leads people stuck on which degree wedge is the sand wedge. You’re looking for the 54-degree wedge – this is the angle is perfect for getting up and down from the bunker with a minimal effort. The angle and groves make it perfect for generating a decent spin when playing out of the bunker. I personally use a 60-degree wedge (not this exact one) and my advice is – if you buy one practice with it first. It’s a tricky club to hit and master due to the real loft in the face. Take some time on the practice ground and get used to hitting it and seeing the spin you’ll get. This can be referred to as a loft or lob wedge by some golfers and manufacturers.